On 23-26 August 2017, the 6th Lindau Meeting on Economic Sciences took place in Lindau (Germany) on Lake Constance. The Lindau Nobel Laureate Meeting was born in 1951, when seven Nobel Laureates agreed to participate in the first “European Meeting of Nobel Laureate in Medicine” held in Lindau. This extraordinary meeting was conceived as a European initiative of post-war reconciliation among scientists. The initial success led to the establishment of periodic meetings of Nobel Laureates in Lindau dedicated alternatively to the Nobel Prize disciplines physiology or medicine, physics and chemistry. In 2004, Economics has been included among these disciplines and, since that moment, once every three years, about 20 Nobel Laureates in Economics convene at Lindau to meet the next generation of leading young economists and start a dialogue aimed at exchanging knowledge, ideas and experiences among economists of different generations and cultures. 360 Young Economists have been selected to take part in the meeting together with 19 Laureates of the Sveriges Riksbank Prize in Economic Sciences in Memory of Alfred Nobel. The opportunity to join the meeting has been provided exclusively to outstanding young economists, who passed a multi-step application and selection process in order to participate in the meeting. Therefore, those accepted to the meeting, having successfully mastered the application process, undoubtedly represent the emerging generation of leading young economists. Among the 360 participants, 85 of them has been further selected to present their own research and discuss it up to six laureates. 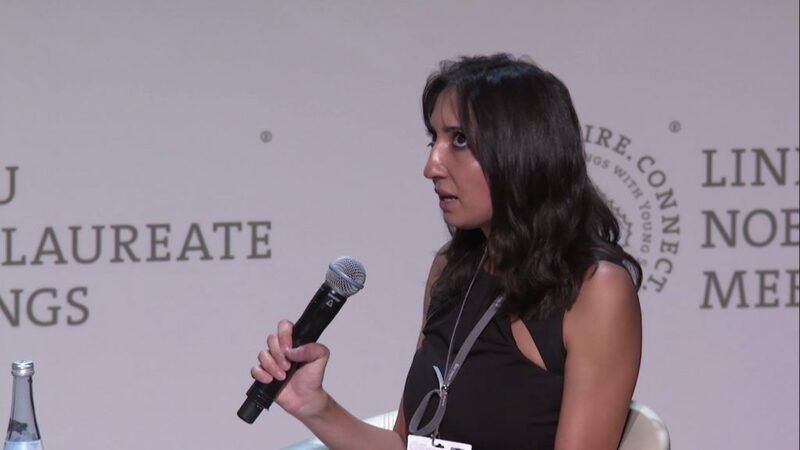 On top of that, the young economists who authored the best 3 research proposals have been invited to share the stage with the Laureates in the three scheduled panel discussions – on contracts, incentives and organization, new conditions for monetary and fiscal policy and inequality – one for each panel. The topics of the panel discussions reflect the key focus at this year’s meeting on monetary and fiscal policy, contract theory, as well as the economics of inequality. In fact, Mario Draghi, President of the European Central Bank, was the keynote speaker at the opening ceremony, with a speech on the effects and results of Quantitative Easing in the euro area. Moreover, the attending 19 Laureates included Oliver Hart and Bengt Holmstrom, who received the 2016 Nobel prize for their contribution to contract theory. BigDataFinance Innovative Training Network has played a significant role in 2017 meeting. Indeed, the ESRs Chiara Perillo and Vladimir Petrov have been selected for participation in the 6th Lindau Meeting on Economic Sciences. Perillo has been further selected to present her own research and discuss it up to six Laureates. 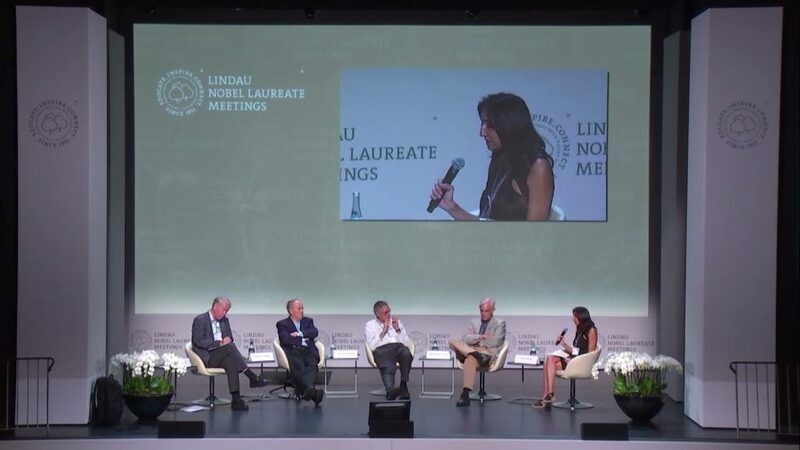 However, what have made the BigDataFinance protagonist at the 6th Lindau Meeting on Economic Sciences has been the invitation of Chiara Perillo as a panelist in the panel discussion on new conditions for monetary and fiscal policy, together with the Nobel Laureates Peter A. Diamond, Edward C. Prescott and Christopher A. Sims. “If someone had told me that in the first year and a half of my PhD I was going to share the stage with three awesome Nobel Laureates in Economics, I wouldn’t have believed it” says Chiara Perillo. Indeed, this achievement of BigDataFinance has been particularly impressive due to the fact that Perillo has been the only PhD student invited as a panelist, together with a post-doc researcher and an assistant professor. Moreover, due to the recent implementation of Quantitative Easing in the euro area, the topic of this panel was at the core of meeting discussions, with the extra contribution provided by Mario Draghi at the opening ceremony. Perillo’s intervention was focused on the role of intra-financial interconnectedness during the last financial crisis and on the developments in terms of methods and policies accounting for it. She also brought out the new challenges for the economics discipline, in terms of new methods for dealing with Big Data and accounting for them in economic models. “During the crisis central bankers didn’t know the actual exposures of financial institutions and I think that the fact that their disclosure has been included in the regulation is very important to determine the level of systemic risk existing in the system, this is why it is important to take into account this large amount of data that are very granular” says Perillo to motivate the crucial role of BigData. To mention the words of Martin Hellwig, moderator of the panel discussion and Director of the Max Planck Institute for Research on Collective Goods in Bonn, “there seems to have been some agreement between Peter, Chris and Chiara about the fact that some analysis of the financial sector and its impact on the macroeconomics is important.” However, “Chris was saying we have a wonderful zoo of theoretical models, but the empirical base is unclear and he expresses some criticism about big data analysis, whereas Chiara was saying that interconnectedness within the financial system was very important for contagion and needed to be analyzed and that big data analysis was probably the way how to get some handle on this.” Such a contrast, together with the stimulating exchange of opposite views between Prescott and Sims on topics at the core of the European policy debate, such as austerity and growth, made the panel discussion a real success. This was due to the panelists engaging with each other, making their points clearly, and bringing out the issues that were at stake. As typical in Economics, some disagreement remained, but the audience got a clear idea of the panelists’ views and why they differed, providing numerous inputs for reflection. This is the best that a discussion in Economics can do.